The Nexus Whistle is a pea-less design that is ideal for water environments. It's loud, has a built-in clip and a hole for lanyard attachment. 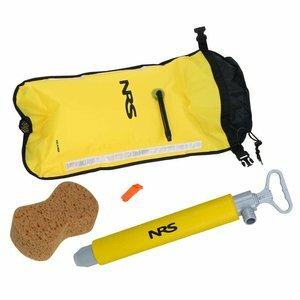 The NRS Paddle Float is the best on the market. You only need to inflate one chamber when you need to rescue yourself; we add a second chamber for safety and dependability. Each chamber displaces 7 liters - almost 2 gallons. The NRS Bilge Pump is a heavy-duty pump, moving 8 gallons a minute to dry your boat out in a hurry. Comes with its own foam float that saves it if lost overboard. The Boat Sponge takes out the last bit of moisture and the sand and silt that the Bilge Pump doesn't reach.